Some time ago, a colleague who wants to become an amateur, was given a 13 elements 70 cm yagi. My colleague asked me to test it, so it was put into the mast early September. With the upcoming IARU contest in October, I decided to wipe the dust from my 70 cm transverter which I still had. It took some effort to get it going again. The 2 m exciter was not used for some time and had to be tweaked as well. The transverter uses double conversion, to prevent interference from the 3rd harmonic of the input signal. Fortunately, measurement equipment made its way to my shack, so I was able to confirm that the output is acceptable. The days before the contest, the rig was ready to go. The antenna was already checked before and the VSWR is nearly 1:1. The cable is about 10 meters RG213, so the loss should be less than 2 dB. I listened several times, but no one was heard. A bad sign? Well, it was simply a disappointment. I spent about three hours to get 19 QSOs. Did I connect my dummy load by mistake? In the past, the band would be crowded with stations. But now? Although I heard a station giving serials over 300 around 20:00 UTC, most numbers I heard were well below 100. Where is everyone? Just incredible. Even though the station is very modest, it is evident that the activity has decimated. Maybe, dropping the CW requirement for HF is one of the reasons for this unfortunate development, because amateurs with VHF licences moved to HF. It worries me that the lack of activity may lead to losing UHF/SHF bands, also because mobile communication demands spectrum and there will be a day when administrations propose to reduce of even drop frequency bands assigned to the amateur service. “Use it or loose it”, is a very appropriate saying in that respect. Despite the low activity, Sunday allowed me to make some nice QSOs that made me feel happy, so in that respect, the contest was successful. The first 19 QSOs resulted in almost 4,000 km, with 205 km average distance. 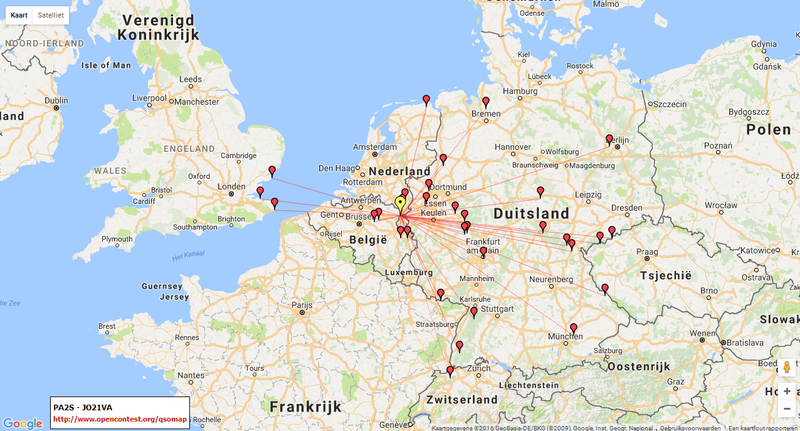 On Saturday, two QSOs were made late in the evening and the remaining 11 on Sunday, adding 4,700 km to a total of 9607 km. The average distance was 361 km. Considering the very modest rig with about 10 Watts output and the small 13 elements Yagi, it was not bad at all. The markers are not 100% on the spot, but one gets an idea about the coverage and activity. Right from the start, I noted the large amount of aircraft scatter. After the long period of over 20 years of inactivity, the difference with the past was noticeable. Without air crafts, I would guess that my range would end at some 300 km or so. One might say that the “DX propagation” is artificial. Anyway, it was nice to take part and to be on UHF again after so many years.